We rid ourselves of much stuff when we moved to France. Having no idea where we’d be living and what we’d be doing, we brought as little as possible. This included bookshelves. Of course the books, we brought. Once we settled into a place, a decision would be made on where to put them. There are two main rooms in the farmhouse, The Mess and The Library. After a well planned, preshopped, preprinted list-in-hand Ikea trip, I returned home with “The Lambert.” The Lambert got its name from an unfortunate run-in with a “hot,” “new” Adam Lambert single that I happened upon. A very annoying song. The video however grabbed me because within a few seconds I saw the bookshelf system I was about to buy. Adam kept pouting in the way and I kept trying to see around him so I could make sure this was the color and size I wanted. It was the one, fer sure. And a name was born. 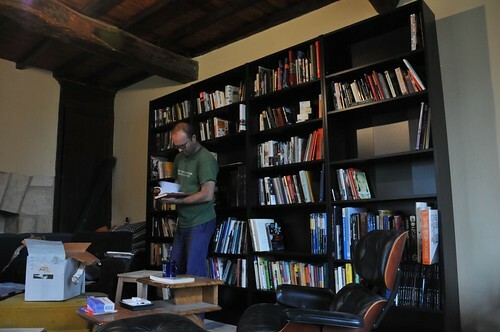 The Lambert snuggled in a lot of the books and we have a few other bookshelves on the other walls for the rest. The kids books, however, haven’t found their place yet. When the last turn of the allen key was complete and The Lambert was erected, The Library got its soul. Brent and I spend any extra time we have sitting in the Library reading, talking or thinking. It’s now one of our favorite rooms.